The New York Yankees are definitely not off to their best start, as they sit 5-7 with a nine game homestand approaching. 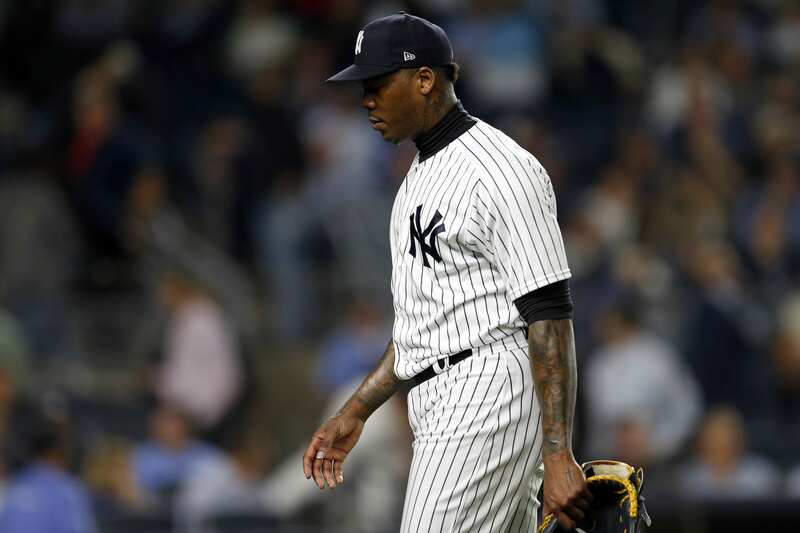 The Yankees are down just one reliever, but their all-star caliber bullpen has been awful so far. That’s the current Yankee bullpen ERA. That’s about two earned runs per nine innings too high. With four all-star level pitchers healthy in Chad Green, Adam Ottavino, Zack Britton, and Aroldis Chapman, Ottavino has been the only one with success, an ERA of 1.29 in seven innings pitched. Chad Green is the most worrisome of the four. His ERA is at nine and has already been charged with two losses, including one against Houston. Zack Britton has an ERA reaching towards five and has a loss too. Chapman is at 3.60, with his velocity still down a bit, but is expected to increase. His accuracy has improved from last year, only issuing one walk in five innings. His K/9 rate is still sky high at almost 13, which is obviously a good sign. Though not one of their best relievers, Jonathan Holder has struggled, too, with an ERA of 5.40. He is a key guy in their bullpen, normally used in high-leverage situations in middle innings or extra innings. The only real positive out of the bullpen so far is that Luis Cessa is pitching well. The Yankees are hoping this continues for him and the team. Remember, he is out of options so for him to go to AAA he must clear waivers. After a poor start on Wednesday by James Paxton, his ERA dropped to 6.00. Following him in the rotation is another starter whos’ ERA is in the sixes: JA Happ. In two games, Happ is 0-1 and has pitched just eight and a third innings. This could potentially cause bullpen problems due to them having to pitch more than they should. Last time out, he gave up five hits and two runs to the Orioles in a personal no decision, but a win for the team. Friday against the White Sox would be the perfect time to get back on track and put one in his win column, as well as the team’s.